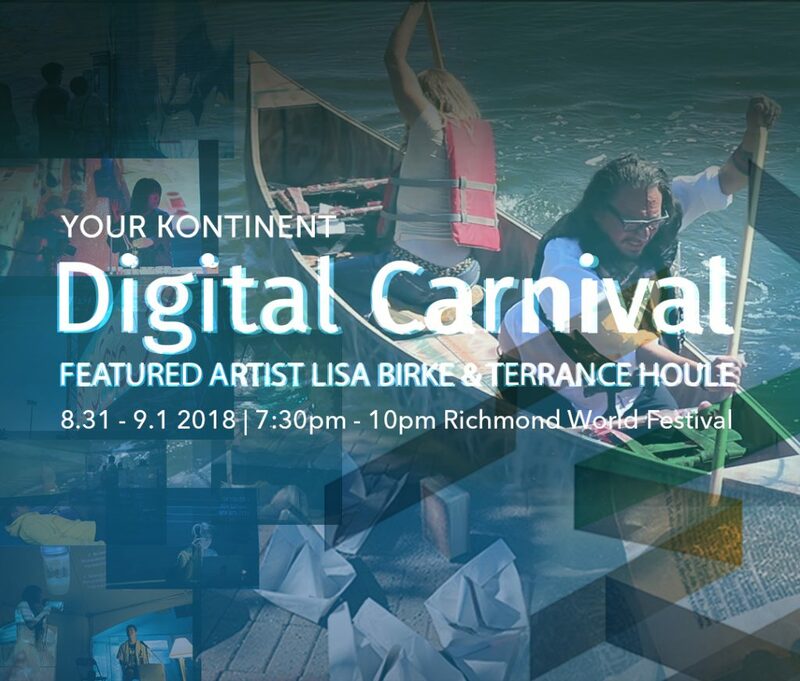 In support of Cinevolution Media Arts Society’s 7th annual Digital Carnival and Richmond World Festival, Richmond Art Gallery hosts a special two day installation by artists Terrance Houle and Lisa Birke. The centrepiece of the festival, Different Ways is a collaborative work of artists Lisa Birke and Terrance Houle. The installation will invoke and reimagine first encounter between European settlers and Indigenous Peoples. The work takes form through live performances and media elements. Responding to the Carnival’s theme of AIR, Lisa and Terrance seek to make visible the ties of history by connecting with the spirits of the past, imaging a future that is inclusive of all our different ways. Digital Carnival is an annual festival showcasing the works of national and international artists working at the forefront of media art. Digital Carnival is co-produced by curator Wynne Palmer and Cinevolution Media Arts Society as part of Richmond World Festival. The 2018 installment explores the theme of AIR, a metaphor for spirituality, intellect and transformation. AIR offers an opportunity to inform our approaches to various cultural understandings and ultimately question our relationship with the natural world. Terrance Houle is an internationally recognized interdisplinary media artist, based in Calgary and a proud member of the Kainai Nation, whose work touches upon themes of colonialism. Houle’s practice exhibits a wide range of diverse mediums and tools of mass dissemination such as billboards and vinyl bus signage in his active involvement with Aboriginal communities. Lisa Birke an award winning Canadian experimental short film maker, examines notions of ‘self’ through the lens of gender. Lisa utilizes traditions of painting; digital video and performance in the pursuit to challenge the cultural tropes of women embedded in our consciousness.